A Nova episode currently in reruns on PBS features bird fossils discovered in China that have shed new light on the origin of flight in birds. Wind tunnel tests on a life-like model suggest a traditional assumption about hip articulation in fossil birds is wrong. Instead of attaching in a running posture capable of holding the animal's weight, the hind legs attach at a different angle. Researchers call it "splayed" posture, and it is found in crocodiles and other branches of reptile phylogeny. Splayed articulation allows the legs to extend backwards toward the tail, useful for actions like walking on four legs, diving, leaping and gliding. Running on splayed legs means less power and speed, so the new fossils make the hypothesis that birds evolved flight by being able to run at flight speed and leap into a glide less likely. Part of that hypothesis is the idea that the large middle claw on the hind legs was a "killing claw" thrust at victims using the same power and articulation needed for running. Splay posture suggests other functional possibilities, and the claw may instead have aided in climbing, perching and propelling the protobird from a branch. Instead of jumping from the ground into flight, the first birds dove into glides from a perch. There is one more assumption that must be questioned, that protobirds dove into the air. More likely, they dove into water, a more buoyant fluid that creates lift at lower speeds and weaker wing strokes. The fossil record of birds is consistent with a marine origin, with diving birds like loons resembling fossil ancestors more than other modern lineages. Swimming is easier than flying, and wings likely evolved as swimming appendages before developing the power for airborne flight. This is the shed skin of a stonefly. Aquatic all its life, the insect crawled from Hazel Creek in July, cracked open its thorax, wriggled out, pumped its wings and took flight on misty night air. 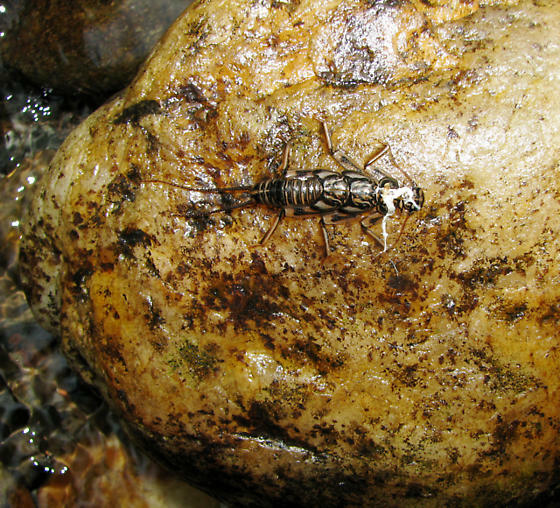 The white fibers on its head are like an umbilical cord, a remnant connection to the stonefly's former body. I found the skin on a rock the next morning. It could not have been there long since the rock had been submerged by the prior day's afternoon rain. As the water receded, the stonefly crawled atop and began its brief aerial adulthood. It will attempt to mate and contribute to the batch of eggs laid in the creek, timed to hatch as autumn leaves drop into the water, bringing nutrients on which the creek's ecosystem depends. Many types of insects and worms live on the rotting organic material that perpetually washes into a mountain stream, and these are prey for crayfish, darters and salamanders, in turn eaten by trout, raccoons and owls. More than 100 species of stonefly occur in Southern Appalachain waters, with some likely undiscovered, some lost to science at the turn of the last century due to intensive logging, chestnut blight and slaughter of the passenger pigeon. There are more than 1,000 species of stonefly worldwide. Nine families occur in our region. The age of their oldest fossils (about 250 mya) combined with the geological history of the Appalachians makes it quite likely stoneflies evolved in these here hills. The first winged insects were mayflies, which soon gave rise to damselflies and dragonflies. It was not long after that another mayfly lineage morphed into the first stonefly. All this took place in the Southern Appalachians some 300 million years ago as the shallow, inland sea west of the mountains receded, leaving behind the Cumberland Plateau and finally the Mississippi basin and the grand river herself. The pictured skin is about an inch long, not counting the tails, and this is about as big as stoneflies get. They resemble roaches, and the similarity is not coincidence. It is likely the roach branch on the tree of life arose from the stonefly limb. In fact, the common ancestor of roaches, crickets and the whole Orthoptera assemblage may have been a stonefly. Stoneflies spend most of their lives crawling slowly through the stones and muck of a streambed, grazing on crud, shedding occasionally to grow, then one day crawling from the water to sprout wings. Their flight is weak and slow, and they have little ability to manuever. If they run into something, they cling. Their search for a mate is clumsy and fraught with peril, but they have been succeeding for hundreds of millions of years, long enough to diversify into many genera and spawn a major assemblage of terrestrial insects. Evolution is a scientific theory; it explains much of what we observe in the living world. Atomic theory explains observations in chemistry. Gravity explains observations of the cosmos and movements of earth-bound objects. Theories are grand ideas which illuminate and elucidate what we see around us: life, the universe, all that. Many refuse to see the beauty and truth of evolution, and a common ingredient among adherents of intelligent design, baraminology or other supernatural explanations is a poor appreciation of the diversity of life. This lack of appreciation is understandable. The modern world frees us from worrying which plants are edible, what kind of wood burns best or which insects are truly a threat, so it is easy to become oblivious to the huge variety of plants, trees, insects and life around us. No naturalist doubts for a moment that life is a grand tableau of evolutionary lineages changing and diversifying. Doubt comes from not realizing how grand the tableau. We can all tell a pine tree from an oak, but if your curiosity stops there, can you be expected to understand the evolution of flowering plants? Fortunately, it is not necessary to know every pine tree or moth in order to appreciate life's diversity. Knowing the basic parameters -- about a dozen pines occur naturally in our region a thousand or more moths -- is adequate, or at least a good start. An understanding of biodiversity fosters stewardship and wisdom. Just as gravity explains Earth's trajectory around the Sun, evolution explains the diversity of life. To appreciate evolution, you must first appreciate what needs to be explained, and that is biodiversity. Plants, fungi, microorganisms, mammals, spiders, birds, insects; evolution explains them all. Intelligent design and other flavors of creationism explain nothing. They push diversity into the unknowable and render planetary history and the tableau of life an incoherent mess. That is unacceptable. Evolution has no competing theories because nothing else comes close to explaining as much about life as evolutionary theory does. I have decided a running theme of this blog should be the diversity around us. 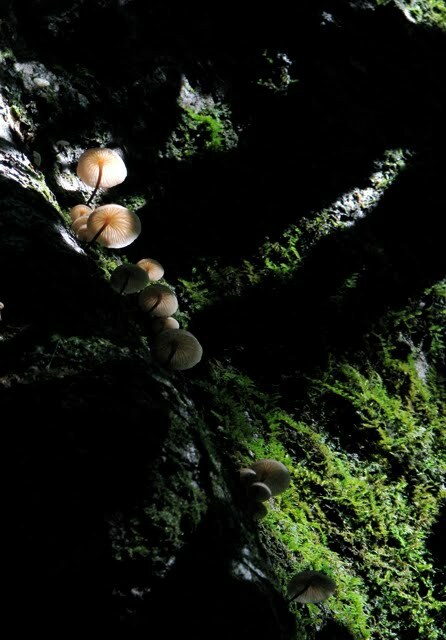 Southern Appalachian forests are a good classroom for learning what evolution explains. Our mountain's age corresponds to the earliest emergence of terrestrial life, plant and animal, so local natural history encompasses events like the origin of flowering plants, insect flight, mammals, birds and the rise and fall of dinosaurs. Much can be learned from the patterns of diversity around us.